For my shadow box, I put a U.S. flag and a Salvadorian flag. The U.S flag represents my nationality because it was the country that I was born in. The Salvadorian flag also represents my race and ethnicity because I was born in the U.S but my family came from El Salvador. Also African-American is half of my race and ethnicity. The black paper in the background represents my Black background in terms of my ethnicity. Also I put money on the background. I put money to show my co unter narrative. This shows my counter narrative because it shows that Black people do have money and proves the stereotypes wrong. For the dominant narrative I put a KFC bucket because people think that Black people like KFC. Also the person with the question mark resents the dominant narrative for Black people because people think that sense I am black my dad left me, but it is true. But a counter narrative is my baby pic. It is a counter narrative because it shows that colored people have a good home. Also the sign that says no gang also represents the counter narrative because people also think that Black people are in a gang but I am not in a gang. I have also chosen a quote which is “never give up.” I have chosen this quote because this quote keeps me going. 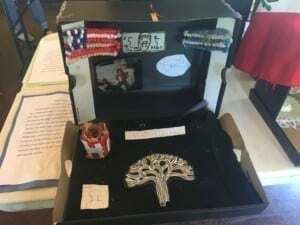 Christopher’s Shadow Box- Artist Statement by Chris is licensed under a Creative Commons Attribution-ShareAlike 4.0 International License. I like how you made an American flag with beeds. It really stood out to me how you expressed the nationalities you have. This tells me you have a lot of pride in who you are. “I have also chosen a quote which is “never give up.” I have chosen this quote because this quote keeps me going.” This quote stood out to me because it tell me that you are not a weak person who gives up quick and is very ambitious. Thanks for the comment. Something that I can do is to follow the black lives matter movement to stop the dominant narrative for black people. Really like the explaining of your counter narrative. What can you do to change the ideology of the dominant narrative? This stood out to me because I can see that you’re a great person and I see that you have a lot of pride in yourself. Is salvadorian not your nationality as well? It can be one of your chosen identities. So you have all these stereotypes, you prove them wrong by being the opposite. Do you think this will make any change to how these stereotypes will affect you or your day to day life? What can you do so that you can change the dominant narrative?